East meets West in this Japanese Tex Mex of Tuna Sashimi Tacos. The kaleidoscope of colour and taste definitely won’t disappoint. This dish is simplicity at its finest with premium ingredients that are second to none. I used the very best tuna sashimi; fresh from the Sydney Fish Markets (which was surprisingly very cheap) and added citrus for a burst of sweet and sour zing to complement the melt in your mouth tuna. I didn’t want the taco shells to distract from the fresh and rich flavours and therefore decided to use Papadums for my taco shells; with the thin, light and crispy texture perfect for scooping the tuna sashimi. East meets West in this Jap-Tex-Mex, Tuna Sashimi Tacos. The kaleidoscope of colour and taste won't disappoint. Prepare the Wasabi Granita 3-4 hours beforehand. In a small bowl, combine the soy sauce, orange juice, lemon juice, black pepper and olive oil and mix. Set aside in the refrigerator until required. Combine all ingredients to make the tuna marinade. Shallow fry the papadums or wonton papers. Place on absorbent paper and drain off any excess oil. Papadums won't detract from the fresh and rich flavours of the tuna sashimi. Finely grate a radish and thinly slice another radish and set aside. These will be used as garnishing. Cube an avocado and set aside. Thinly slice the tuna sashimi into pieces approximately 6-8cm lengths. On a serving plate, arrange the avocado into a circular base. Place the tuna sashimi into the soy marinade for 60-seconds. Position the tuna on top of the avocado, then drizzle a little of the soy marinade over the top of the tuna. 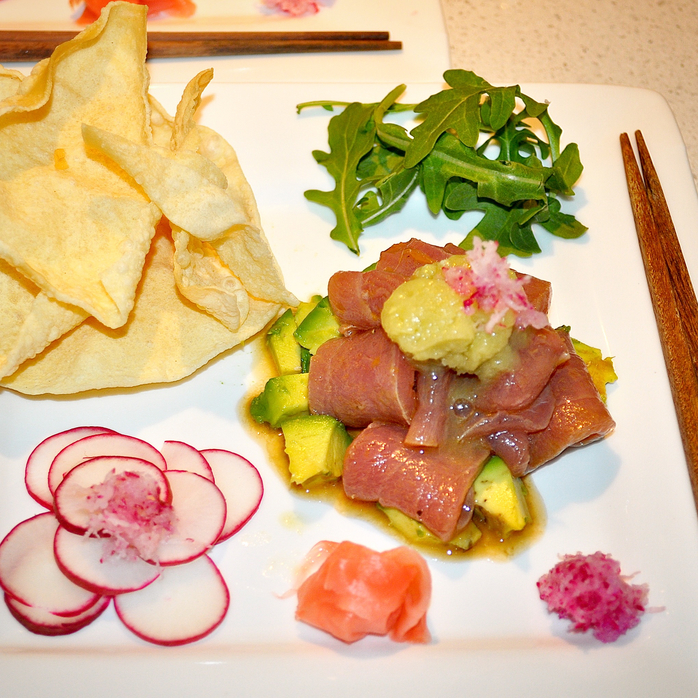 Place a spoonful of the Wasabi Granita on top of the sashimi then garnish with a little of the grated radish. Finally, decorate the serving plate with the sliced radishes, rocket leaves, pickled ginger and papadums. Serve immediately using the Papadums as Taco Shells to scoop the Tuna, Soy Marinade and Wasabi Granita – it’s heaven on a plate.